Cyrus announces Signature Series DAC, preamp and power amps | What Hi-Fi? Cyrus has announced the first models in its new Signature Series range: a DAC, DAC/preamp and two mono bloc power amps, all fine-tuned by the company's Technical Director, Peter Bartlett. Drawing on the work done to create the limited-edition Anniversary Series, designed to mark the company's 30th birthday, the Signature Series models form the basis of Cyrus's new flagship range. The initial line-up comprises the £1750 DAC X Signature, the £2750 DAC XP Signature DAC/preamp and the Mono X 200 and 300 Signature power amps, at £1950 and £2750 respectively, and more models are expected to join the Signature Series later. 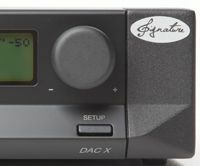 The DAC X Signature uses twin 32-bit stereo converters in dual-mono configuration, and are isolated from the control systems to improve clarity. A custom-designed ultra-low-noise toroidal transformer is used, along with multiple levels of regulation to give each section of the unit a noise-free power supply. The same DAC technology is used in the DAC XP Signature, which also has upgraded power transformers, new filtering and smoothing on the DAC supply, new 'short path' analogue switching stings and an uprated XLR balanced output design for greater signal purity. The two power amps feature upgrades including a new input buffer op-amp, with a higher slew-rate and higher gain bandwidth, for a smoother high-frequency response, plus extra power filtering to reduce electromagnetic interference. These improvements, plus the zero-feedback design of the amps, give what Cyrus describes as 'open imaging with inky-black backgrounds'. The Signature Series components are available now.